So Shakespeare continues on the BBC with Henry IV Part II and Falstaff discovering just how hollow the crown can be. It remains testament to Shakespeare’s talent that despite the clear danger of offending the monarchy he could write a play about kingship that would show it to be an undesirable burden that turns saviours into tyrants. The old dying king, Henry IV, is laid bare before the audience; his noble persona stripped aware by a ravaging illness and worn down by the internecine rivalries of his nobles and the licentious behaviour of his heir. The regal nature of Jeremy Iron’s Henry has long since disappeared to be replaced by a solitary figure forced to send others to fight his wars and left to restlessly wander the palace at night exhorting that “uneasy lies the head that wears the crown” [III.i]. It is worth mentioning that Irons is magnificent as Henry IV – as it is a part often forgotten under the weight of the Hal/Falstaff relationship. Iron’s Henry captures the viewers’ attention with an exceptional understanding of verse speaking and bringing real intelligence to the dialogue. The great speech where he discovers Hal upon the throne and lashes out with “What! canst thou not forbear me half an hour? / Then get thee gone and dig my grave thyself” [IV.v] proves one of the real highlights of the series so far and brings just a glimpse of a potential King Lear – a proposition that really does make the mouth water. Tom Hiddleston’s Hal does not provide the tempting alternative that Shakespeare would later paint with far more grandeur in Henry V. As with last week, Hiddleston gives us a Hal that, for all his revelry and low-flung behaviour, is very much in control of his character. He may feel warmth to these people but he also is self-aware enough to retain a certain detachment as a king would his subjects. Hal is shown to be the kind of figure who would make a good king but possibly an even better tyrant. 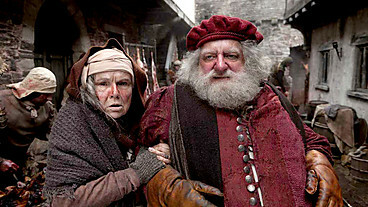 Richard Eyre focusses on melancholy as the central theme of this production of Henry IV Part II. It is a melancholy centred around the relationships Falstaff has throughout the play which draw out his own tragic self-awareness that so often is hidden behind bluster. Simon Russell Beale gives us a Falstaff that continues to scheme but who is fatally unable to change his character and for whom the dead-hand of time continues to advance. The scene compounds this tragic awareness by the dramatic irony of knowing that Falstaff is cementing his own later rejection even as he lays out the reasons for it – as Hal and Poins lie above listening to every word. Eyre cleverly restages aspects of this scene – making literal the implied bedding of Doll and giving Falstaff’s ‘I am old, I am old’ a very clear reference point. Eyre’s decision also lends the scene a far more cruelly voyeuristic aspect than is usual. 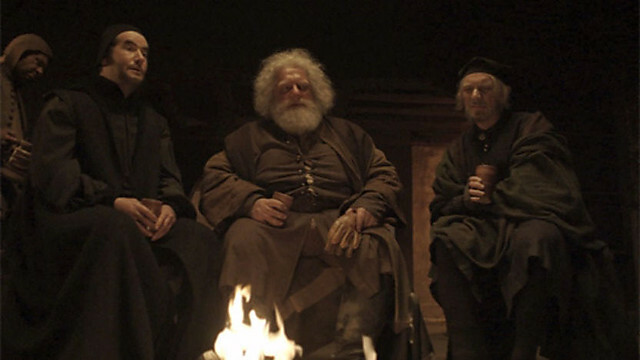 Hal and Poins are shown to be watching from the loft rafters rather than entering the room, so it comes across less as a practical joke and more of a chance to spy on Falstaff. There is fury and no humour in Hal’s ‘would not this knave have his ears cut off’ as he hears Falstaff ridicule him to Doll and then a soft look, almost of pity, that comes with the realisation that there can be no redemption for him. If Russell Beale’s Falstaff was slightly underwhelming in Part I, in part due to the decision to retain a greater focus on Hal, here Eyre allows him the camera’s full attention. Alongside David Suchet and Patrick Stewart, he must stand as one of our most adaptable actors; equally at ease on stage or screen and moving between modern and classic texts at will. He has a natural vulnerability that provides a brittleness beneath the bravado and there are echoes in Falstaff of his remarkable performance as Widmerpool in C4’s production of A Dance to the Music of Time – a shared awareness of being on the outside of greatness looking in but contained within this a constant, dominating optimism about the schemes they plan, and in both there is the inevitable tragic fall. Russell Beale seemed to struggle slightly in Part I to bring to life the comic elements of Falstaff but in Part II he has found a tragic pathos in his actions and it is here that the chinks shine light upon the character. He is almost unwatchable as he scrabbles for an excuse in front of Hal in Act IV Scene ii. He pitiful grovels that he meant ‘No abuse Hal, no abuse’ [II.iv] as he scrambles around for a possible way out. The tragedy lies in the speech to Doll that precedes this moment where he makes clear that he is aware that it is precisely this kind of behaviour that makes his position with the Prince so precarious. When the news arrives from Peto that the King requires him, it snaps Hal into a different gear and his final ‘Falstaff, goodnight’ is delivered with a curt finality that makes clear that goodnight means goodbye. Each reference acts as another hammer blow to Falstaff. He knows he is being forced back to war, that he has made an enemy of the Lord Chief Justice and the weight seems to engulf him as he sits in the quiet country. When he tells Shallow that ‘We have heard the chimes at midnight’ [III.ii] it is clear to the audience that he is making far more than a comment on the lateness of the hour. The final rejection of Falstaff at Henry V’s coronation is the climax of the play and it is always interesting to see how it is presented. Hiddleston plays the speech almost entirely devoid of emotion and if anything a little rushed. He doesn’t so much as look at Falstaff as look through Falstaff as if he doesn’t see him, which adds real potency to the cutting remark of it all seeming like a dream that once awakened he despises. This clear intent is summed up with ‘Presume not that I am the thing I was/ For God doth know, so shall the world perceive,/ That I have turn’d away my former self’ [V.v]. It starts off as a pointed remark to Falstaff before Hiddleston turns to to reassure the crowd and at the moment he is truly King Henry V. It suggests a king that has forever switched off his princely persona and has embraced the regal aspect of monarchy and is reinforced by the addition of Eyre to show soldiers rounding up Doll Tearsheet and Mistress Quickly. This is the cold detachment that is hinted at earlier and even the ‘I know you not, old man’ [V.v], is delivered almost as a dismissive aside. So whereas ‘old’ has been a central rumination for Falstaff over the course of the play for the new king it is barely even worth thinking about. Given the nature of The Hollow Crown to package the four history plays under one piece of branding, it makes for an intriguing question mark over Henry V. It is usually seen as a jingoistic piece of theatre – full of rousing speeches and heroic battles against the French. However the Hal we have been given does not appear to be a King we would want to rally behind and it will be interesting to see how Thea Sharrock chooses to present it.